The conference will be held in the City of Chania on the Island of Crete in Greece at the Akali Hotel. Conveniently located only 500 metres from the centre of the Old Town of Chania, close to Nea Chora Beach, the Akali offers rooms with free Wi-Fi and balcony. It features classically decorated rooms, swimming pool and an open courtyard with snackbar. The hotel’s indoor bar has an open fireplace and a stone archway. 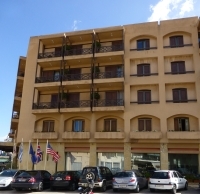 The Akali Hotel is just 1.5 km from the port of Chania and the Airport (for international flights) is a short 15 km taxi ride. Guests can visit the beach resort of Platanias, 20-minute by taxi or car. Agioi Apostoloi Beach and Chrissi Akti Beach are 3.5 km away. Chania is one of the most beautiful cities in Greece and thought by many to be the most picturesque in Greece. Chania is a bustling city with both old and modern sections famed for the Venetian Harbour, the old port, the narrow shopping streets and waterfront restaurants. The Old Town is a major attraction with its twisting narrow lanes and its mainly pedestrianised alleys. There is a variety of old stone villas and houses, many of which have been converted into comfortable hotels, popular restaurants and tavernas, bars, and shops offering a wide variety of gift items. The port and harbour section, boasts impressive Venetian walls that protected the old Firkas Fortress, a Venetian lighthouse, and an ancient Turkish mosque. Chania is the location of one of the island's major airports, and it is also an important port both for cruise ships and ferries. Wikitravel provides a useful guide to the Chania area .. here ..
Now confirmed, the SDM-16 proceedings will be published in the Springer KES series on Smart Innovation, Systems and Technologies!